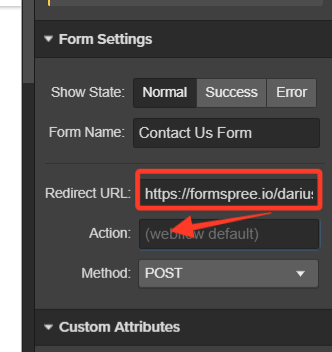 I’m trying to use https://formspree.io/ as a way to redirect my form submissions to my email. I’m currently testing it with the Contact Us Page on my website. The directions say to make sure i change my method to post, and use the redirect URL with my email. I set the method to post, but when trying to submit the form i get an error from formspree telling me my method has not been set to post. Could someone take a look, and let me know if i’m doing something wrong? Formspree is a form backend, API and email service for HTML forms. It is the simplest way to embed custom contact us forms, order forms, or email capture forms on your static site. The form action code is in the wrong place.